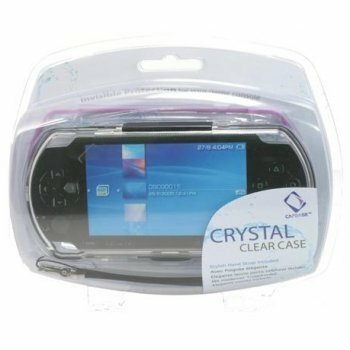 Overview : The Crystal Clear Case lets you view movies without opening the cover as well as easy access to UMD door and memory stick storage. Quality/Usability : New case by Capdase. 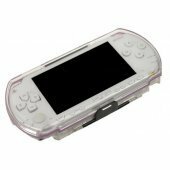 From the start, this kind of looks like the PlayGear Pocket with the clear plastic case. 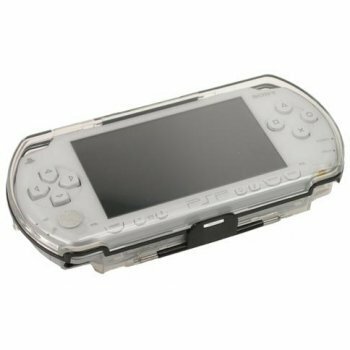 But with the Crystal Clear case, its a little different then the PlayGear Pocket. The Crystal Clear case, there is no colored rubber insert. The PSP itself is held in place by clipping onto the inside of the case. There is no soft or rubber padding. Just clear plastic all around. The cover of the case doesnt open half way or fold 3/4 of the way. 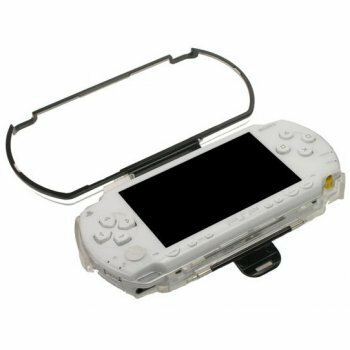 Instead, it opens 360 degrees and rests on the backend of the case so that the cover isnt in the way. It also acts like a mini-grip or so for extra thickness. To close or open the case, there is a clip that is attached to the bottom of the case and clips onto a notch on the cover. On the backend of the case, you can see two slots for the memory stick. The memory sticks are held in place tight. Where the memory sticks are held, is actually a door. 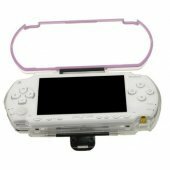 This is access the UMD tray if you need to change a UMD or get a memory stick out without having to remove the PSP. The door itself opens 3/4 of the way but not completely flat. The door latches onto the case by snapping on. With the backdoor open and the UMD tray open, getting access to the UMD is a little tight. The top of the case gets in the way. You can personalize your Crystal Clear case with a different color frame. These frames are plastic. To swap the frames, you simply just pop off the one you want to remove and snap on the one you want. It takes a couple of seconds. Too bad its not held tight because it will pop out if it is hit. The top of the case has openings for the L and R triggers as well as the OPEN button for the UMD tray. Unfortunately, due to the thickness of the case, the opening to the OPEN button is deep in there. If you have big/thick fingers, you'll have a hard time getting to it. Access to the memory stick is easily accessible since there is a open gap. Conclusion : Overall, this is a nice looking case since you can look at movies without having to open the case but protection wise, there is no padding at all. The stylish color frames come off too easily. Trying to push the OPEN button for the UMD tray to open, there isnt enough room especially for those with thick/big fingers. And the opening, once the UMD tray door is open isnt big enough. The top of the case covers it. Nice attempt but it falls short. This is only good if you plan to watch movies or listen to MP3s and want to look at it when the case is closed.